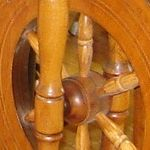 The Grand River Spinners and Weavers Guild brings together people interested in the crafts of spinning and weaving, to enjoy the company of other like-minded people, to explore the many facets of this craft, and to share our knowledge with each other and the broader community. September marks the beginning of our guild year and the first meeting, on Tuesday, Sept.11th at 7:00pm, will be a spin-in. I will also be handing out our schedule of meetings. Guild membership fees of $30 for the year are due. Please return any books, magazines, DVD's or equipment you have borrowed for inventory. The guild dues help to pay for our rent, workshops, the purchase equipment/books and other expenses related to the running of the guild. The guild is demonstrating at Ireland House on Sept.16th. If anyone is interested in selling items please bring them to the meeting. Items must be tagged with your name, general info and the price. Skeins should include yardage as well. I will have sign up sheets for the Caledonia Fair demonstration we do every year. We will be there from Friday to Sunday. If enough people volunteer to do a shift it helps to avoid anyone having to go twice, which is of great help. Please bring any spinning or weaving projects you are working on - finished or not - to show us all! It is always inspiring to see the creativity and skill you all possess! ANYONE NEEDING ONE ON ONE INSTRUCTION CAN COME EARLY AT 6:30 AND RECEIVE HELP FROM OUR EXPERIENCED MEMBERS. We meet on the second Tuesday of each month from March to December at 7:30 pm. The meeting location is the the Seneca Community Hall , York Rd RT 9 and Shannon St, beside the church cemetary. For more information, go to "Contact Us" page and we will get back to you. Membership fee is $32.00 per year or $16 per half year due in October.